The Android OS that Ouya uses states that it is OTG compatible however when I use a OTG Cable in the secondary debug port of the Ouya I get nothing! 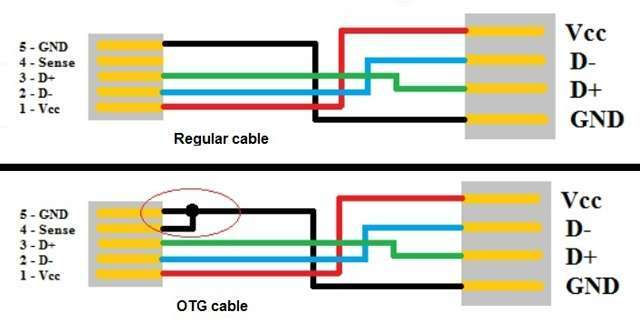 Above is the pin-out schematic of that an OTG cable (On the Go) looks like. The major difference is pins 4 and 5 in the mini-USB are bridged to let android based smart phones know that you are not plugging in a data cable for your android OS to transmit data from your android to a destination device like a your PC. But you are in fact pulling data from a device to your android such as a keyboard or USB thumb drive. I played with using an OTG cable briefly on the Ouya. And it seems like there is no +5v power that is coming down to the line to any device. I tried a self-powered USB hub on my Ouya, however I am not sure if my hub was even compatible so the test with using a powered hub is inconclusive.I should note that under most android operating systems they let you choose what the OTG cable function is for. and by default android keeps this port open at a MTD (Media Transport Device) however the Ouya OS does not allow such a thing! It immediately sets it up for ADB mode. So the usage of this port may still be viable for other operating systems on the Ouya such as the Cyanogen Mods. I thought it would be really nice to have two devices hooked up the Ouya so that I don’t need to carry around a hub for those rare times like 8-player bombsquad. But it looks like I have no choice but to do that.